Winter is definitely a time for hibernation in my opinion. Taking a little extra time to enjoy things like baths and taking care of your skin makes me feel so cosy and relaxed. I have pretty dry skin year round, but Winter is definitely the time of year I notice it the most so I need to have some lovely body products on hand to keep it soft and moisturised. 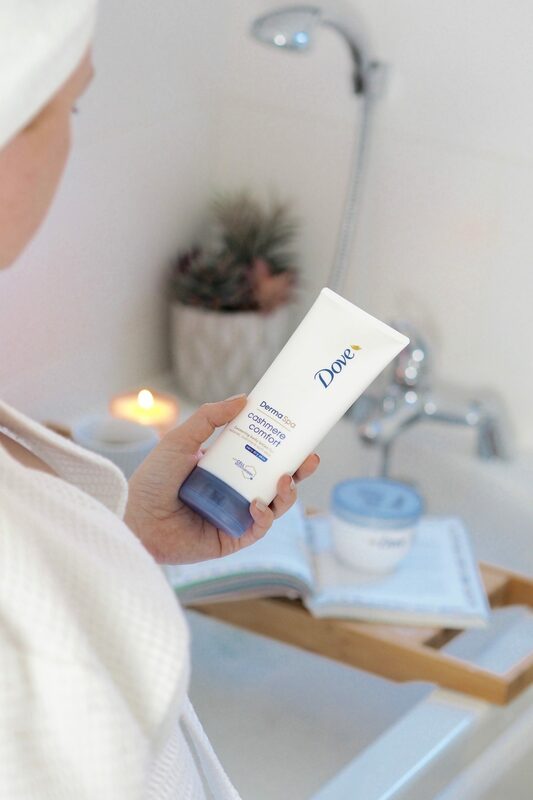 It’s all too easy to forget when you’re bundled up under layers of clothes how dry skin on your body can get in Winter so it’s really worth taking a little extra time to pamper and look after your skin with some lovely moisturising lotions and creams. 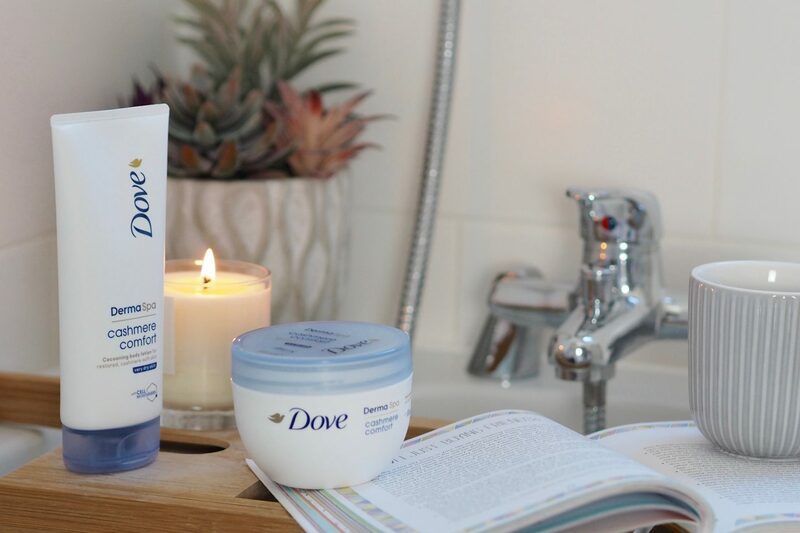 For me, taking that extra time in the colder months means having a soak in the tub and spend a little extra time slathering on those lotions. Going all out and trying to create my own little quiet, pampering spa-like haven so I can just chill out and enjoy the peace for an hour or so. Emerging feeling relaxed, warm and silky soft is my idea of heaven at the moment. With the added bonus of a nice warm bath (not too hot) being amazing for easing a sore back from carrying bump around all day. Along with the perfect temperature the other ingredients include – a cosy candle burning (always at the end where I can see it and nowhere near my head), a mug of hot peppermint tea or cold water depending how I’m feeling. Fresh fluffy towels and a bathrobe warming on the radiator are also a massive bonus for that post-bath phase of pampering. Which is almost as key as the bath itself. 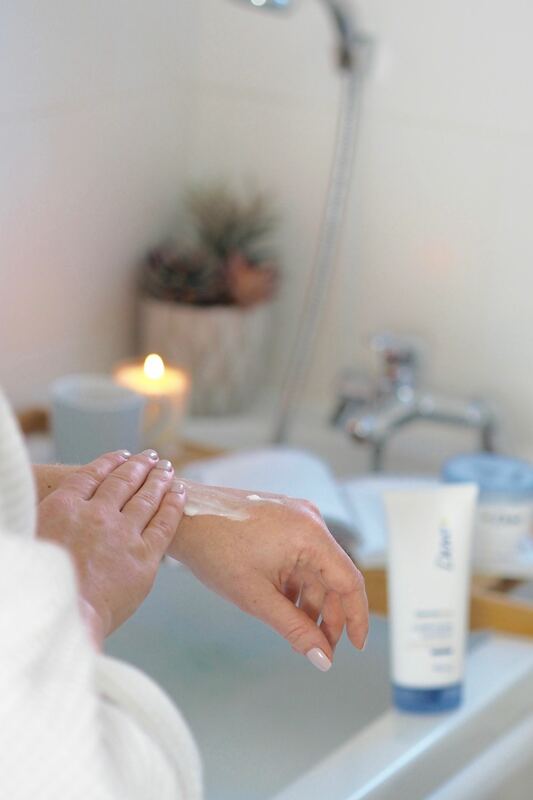 Slathering myself in a gorgeous rich body cream to leave skin perfectly soft and hydrated with a soft and warm fragrance – nothing too heavily scented. Which is where the Dove DermaSpa Cashmere Comfort range comes in as a final finishing touch for a cosy home spa session. The range includes the Cashmere Comfort Body Butter, Cashmere Comfort Cocooning Body Lotion and Cashmere Comfort Rich Hand Treatment. Each product contains a unique formulation featuring Cell-Moisturisers™. The formula is a dream – really rich and hydrating and absorbs into skin really quickly. Leaving it looking immediately smooth but without any feeling of a ‘film’ sort of sitting on top. I’ve used the Body Lotion before and it’s up there with my all time favourite body lotion options. It’s richer than a ‘standard’ moisturiser, but still quick and easy to use. If you don’t have the time or inclination for a full on home-spa session you can still get a little dose of that skin softening goodness, in a speedy and efficient way. 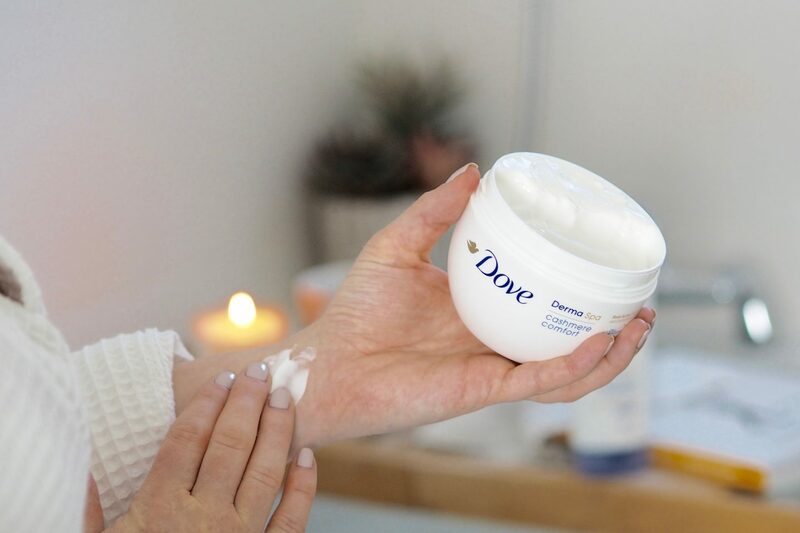 The Dove Cashmere Comfort Body Lotion is the perfect every day moisturiser option and offers lasting moisturisation much like the Body Butter does, but with a lighter texture. Exactly what you need at this time of year when heating and being bundled up can leave skin feeling dry and flaky before you know it. 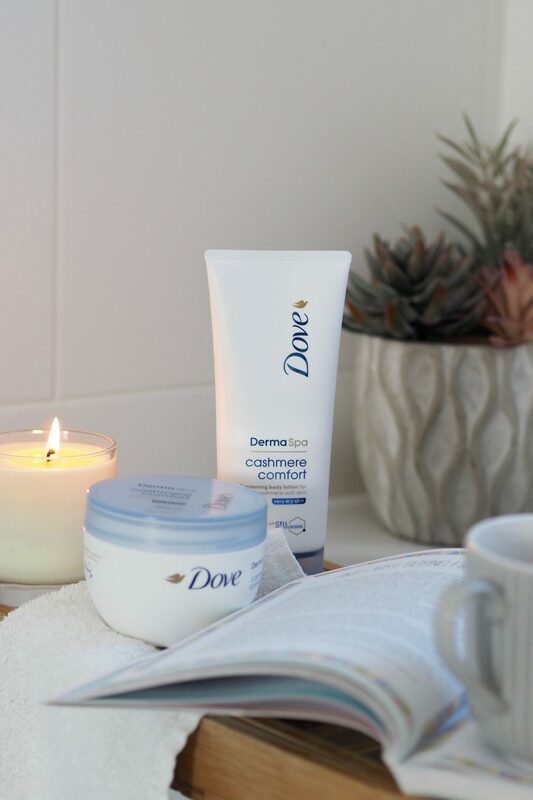 One of the biggest things for me when it comes to any sort of body care product is the fragrance and this is where I’ve long had a massive soft spot for the entire Dove range. It’s just got such a clean scent that I’m a total sucker for. 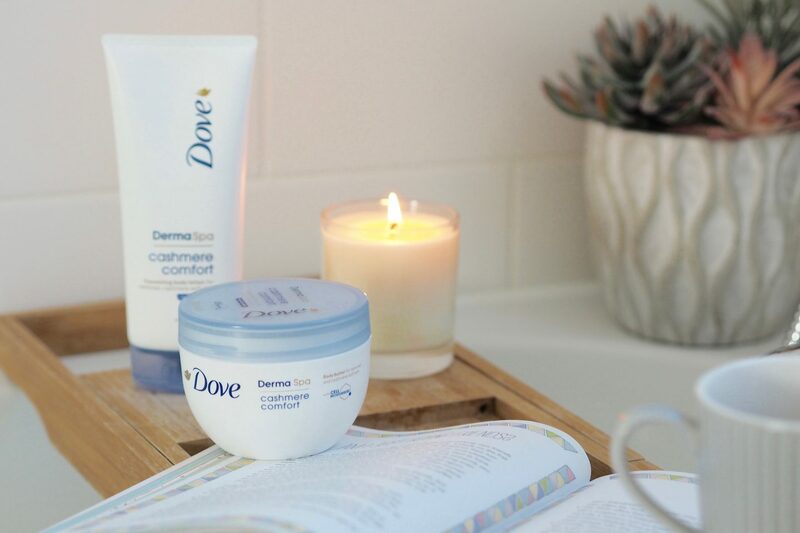 The Dove Cashmere Comfort takes the fragrance to a new level with a blend of creamy vanilla, rich spices and a touch of sensual amber. It still has a touch of that fresh/clean Dove element that they’re famous for, with something a little extra – in a warm comforting way that is just perfect this time of year. 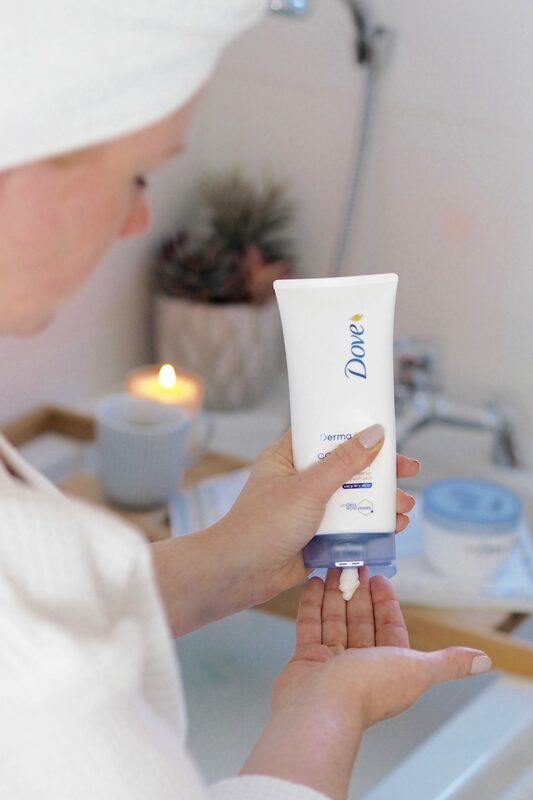 The Dove DermaSpa Cashmere Comfort range starts from £5.49 so it also makes for an affordable addition to a home-spa session. Or even just a lovely day to day body care essential for after your daily shower! Let’s face it, we all need all the TLC we can get in Winter! I haven’t used Dove for YEARS! I don’t know why, I just haven’t been to pick it up but this sounds lovely and reminded me of the signature dove fragrance that feels so warming and homely. Definitely going to pick a bottle of this up on my next shop! I do love the dove signature scent! They carry my favorite deodorant and it’s pretty much the only one I use but I think my next body lotion will be from their cashmere range. They smell so good and they seem really moisturizing! Same – the signature scent is the one I go back to time and time again. There’s something so comforting about it? If you like it, you will love these lotions!